My pillow review series continues today with the Naturepedic organic latex pillow. Naturepedic as a company lives and breathes the organic and natural story. 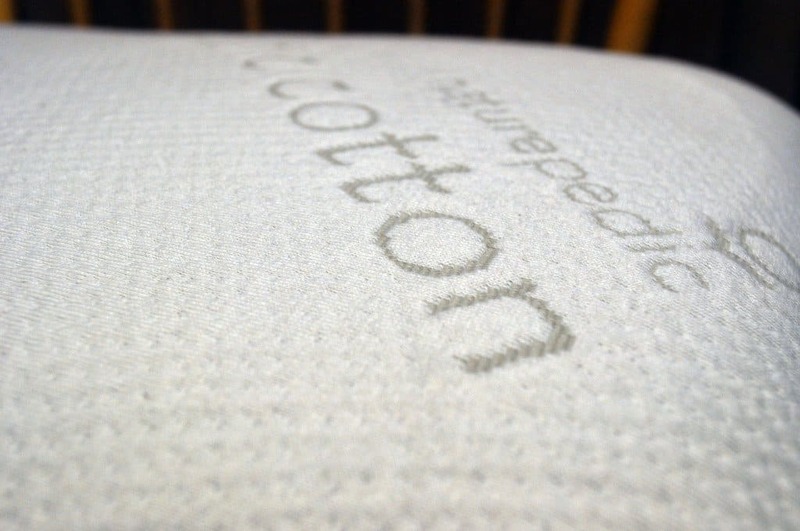 Every sleep product they create is designed and manufactured with the health and wellness of their sleepers in mind. Their solid core latex pillow is crafted to these same standards and designed to deliver great support, comfort, and cooling. Continue reading below for my full review of the Naturepedic organic latex pillow. In a bit of a rush? Click here to skip to the review summary for the fast version. The Naturepedic solid organic latex pillow is constructed from 100% natural organic latex. This pillow uses a solid latex core (as opposed to shredded foam). Solid core pillows provide a high-level of support and help to properly cradle your neck and head. At 4.1 pounds, the pillow is a bit on the heavier side on the broad spectrum of pillows. However, when compared to other solid core foam pillows, it’s fairly average. No flame retardants are used in the construction of this pillow. The pillow is available in standard size (16″ x 24″) and Queen size (20″ x 30″). 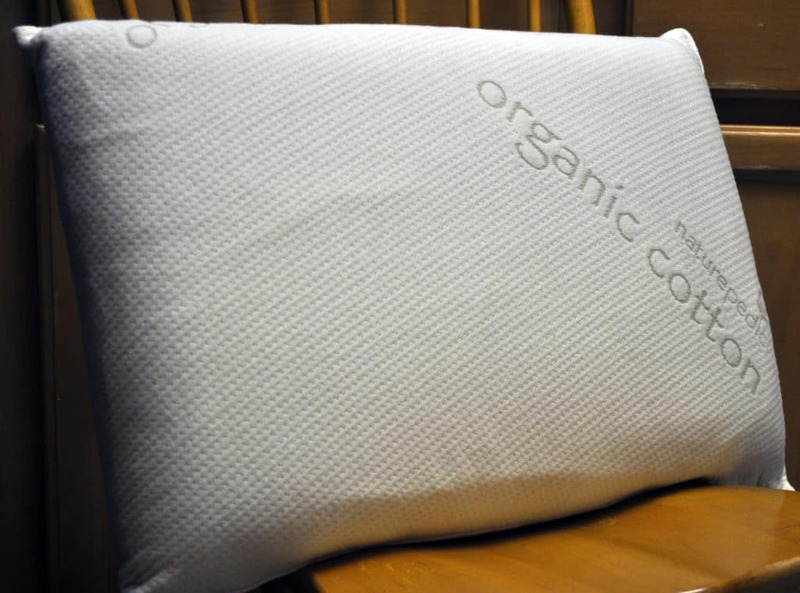 The cover of the pillow uses Naturepedic’s signature organic stretch knit material. Overall, the cover has a nice aesthetic to it. It’s somewhere between an off-white and a cream color. The cover itself has a great tautness and stretch to it (rebounds immediate). Additionally, there’s a subtle textured feel that adds to the style and feel of the cover. Unfortunately, the cover is not removable and it’s not machine washable. You’ll only be able to spot clean the pillow. The most notable feel attribute of the Naturepedic organic latex pillow is simply the level of support. The pillow is built from a core of solid latex. This gives the pillow an exceptional level of support. In a normal lying position on your back or side the pillow does a great job of contouring to your head and neck. Additionally, it’s highly responsive…meaning it rapidly adjusts to changes in your position during the night. This helps to ensure continual adaptive support. The pillow has very strong deep compression support, which is a nice benefit especially for larger sleepers. When trying to compress my hands together on either side of the pillow I was only able to compress by ~50% (and that is with ~30+ pounds of pressure). Even the heaviest sleepers would be unlikely to compress the pillow much beyond this level. This factor will help to maintain support even under great pressures. The weakest attribute of the Naturepedic organic latex pillow is simply the moldability. The pillow has a high degree of compression, a solid core, and great bounce. All of these are wonderful attributes that combine to deliver exceptional support for most back and side sleepers. However, if you are someone who needs more of a cuddly and moldable pillow this one is probably not the right option. Stomach sleepers in particular should avoid this pillow. The lack of moldability and height combine to create a bad spinal alignment situation for stomach sleepers. 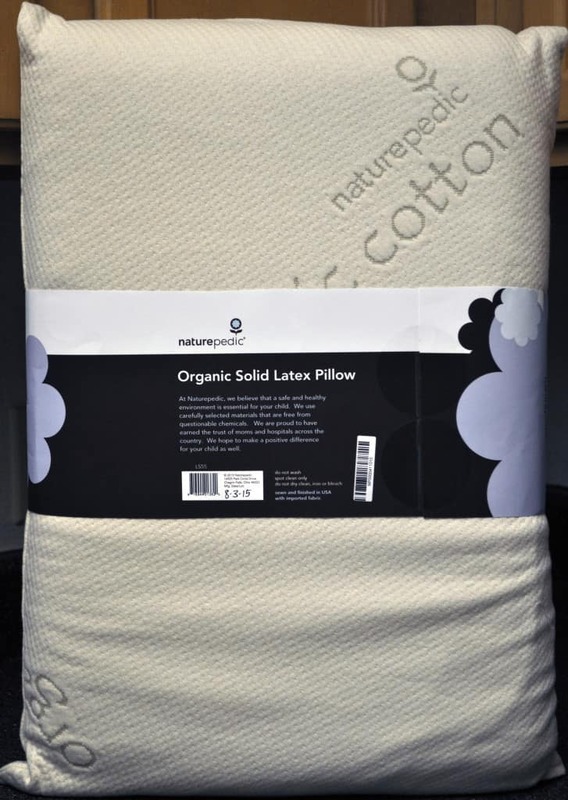 If you’re a stomach sleeper and want to stick with Naturepedic’s organic pillows you’ll want to check out their organic cotton pillow. It’s a nice alternative. All things considered, the pillow checks off most of my boxes. Support is quite strong, as is cooling. At no time during my test did the pillow become uncomfortably warm (latex naturally dissipates heat). The bounce and responsiveness are nice attributes that further improve the overall feel. Very little smell – there’s very little off-gassing smell. In a normal sleeping position I didn’t smell any strong odors. If I put my face directly into the pillow I’m able to smell the latex. The smell has gradually dissipated over time. I would expect it to be 100% gone within the first few weeks of use. Is the Naturepepdic organic latex pillow right for me? The Naturepedic organic latex pillow is a basic, but well made healthy solid core latex pillow. The pillow has a certain balanced size and weight (relative to other solid core pillows) that will make it suitable for most back and side sleepers. However, the height and lack of moldability make it a poor choice for stomach sleepers. Want a medium tall pillow – the Naturepedic latex pillow isn’t excessive tall or excessively flat. It has a fairly standard shape and size. If you haven’t owned a solid core pillow before this can be a good one to start with. Not because it’s a “starter” pillow, but simply because it has a more balanced height that hits a middle ground with regards to support and head / neck cradling. Want high-quality healthy materials – 100% organic cover and 100% all natural organic latex. It just doesn’t get much more natural and healthy than this. You’re a back or side sleeper – for back or side sleepers this pillow can be a good option. It provides very strong support to both the head and neck. However, it has very little moldability. For this reason it’s not a good choice for stomach sleepers. Additionally, the height makes it far too tall for stomach sleepers. You like strong support and bounce – the solid core offers a high degree of support for both head and neck. 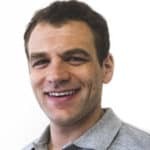 If you’re petite in size, you may find this support to be too strong. However, for most sleepers who prefer robust support the feel should be agreeable. Additionally, there’s a fair amount of bounce as well. This creates highly responsive support that continually changes and molds to the shape of your head and neck. For more information on the Naturepedic organic latex pillow visit Naturepedic.com. The Naturepedic organic latex pillow is a solid core latex pillow that delivers exceptional support, bounce, cooling, and responsiveness. It’s ideal for back or side sleepers who prefer a solid core support feel. The pillow is built from 100% natural organic latex and and organic knit covering that naturally cools and eliminates moisture. A great pillow for those interested in trying their first solid core foam pillow, side / back sleepers, or anyone who needs strong support in the neck and head while sleeping.